When shall the day of these face tattoos be over? Maybe not as soon as I'd hoped. Lil Wayne is one of the most bizarre characters in music. He does what he wants when he wants, and we all sort of just accept it. 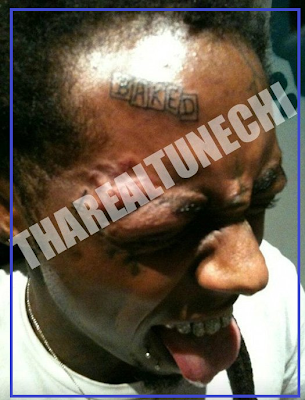 His latest thug life moment comes in the form of him getting BAKED tatted right on his forehead. Now, Wayne boasts having tattoos everywhere and he does. The problem is, people who don't have millions of dollars feel the need to copy the ongoing trend set by people like him. Wayne is an example of someone who will never have to work a 9-5 so he can afford to do what he wants with his appearance.